The greater coucal (Centropus sinensis) belongs to the family of cuckoos, roadrunners and coucals, Cuculidae. The greater coucal species is distributed in Indian subcontinent, southeast Asia and China. These coucal species are not brood parasites. These coucals are polytypic species. The greater coucal (Centropus sinensis) is a large coucal, measuring 45 to 50 cm in length and weighing 230 to 270 grams. The adult greater coucals have chestnut or bronze colored back and wings. The crown, forehead, cheeks and chin are brownish. The rest of the plumage is black or glossed blue to purplish. The tail is long and black. The bill is pale gray and curved. The irises are ruby red. The legs are gray. The hind claw is long and straight. The juveniles have spots on the crown. The breast and the underparts are mottled and barred. Their call is a repeated booming low "coop..coop..coops" sound. 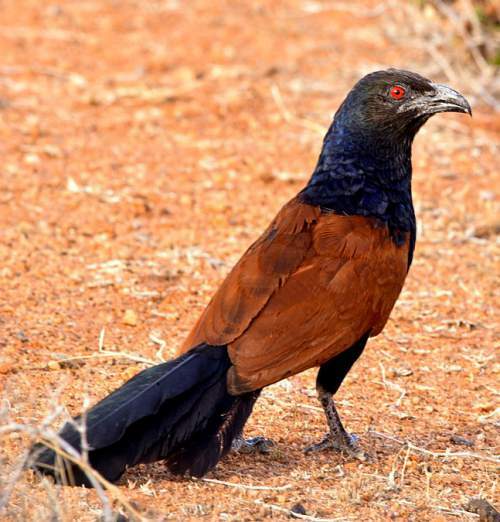 The greater coucal species are distributed in Indian subcontinent, southeast Asia and China. In India, excluding the desert region, these species are distributed in all the states. The greater coucal nominate subspecies C. s. sinensis is distributed in Pakistan, northern India, Nepal, Bhutan, northern northeast India and south and southeast China. The subspecies C. s. parroti is distributed in southern India and Sri Lanka. The greater coucal subspecies C. s. intermedius is distributed in Bangladesh, southern northeast India, Myanmar, south central China, Thailand, Cambodia, Laos, Vietnam and Peninsular Malaysia. The subspecies C. s. kangeangensis occurs in Kangean Islands (Indonesia). The greater coucal subspecies C. s. anonymus is distributed in Basilan and Sulu Islands (Philippines). The subspecies C. s. bubutus is distributed in western Philippines, Borneo (Malaysia and Indonesia), Sumatra and Java. These greater coucal species have low forest dependence. They normally occur in altitudes from 0 to 1200 meters. The artificial ecosystems of these species include agricultural fields, rural gardens, palm oil plantations and orchards. 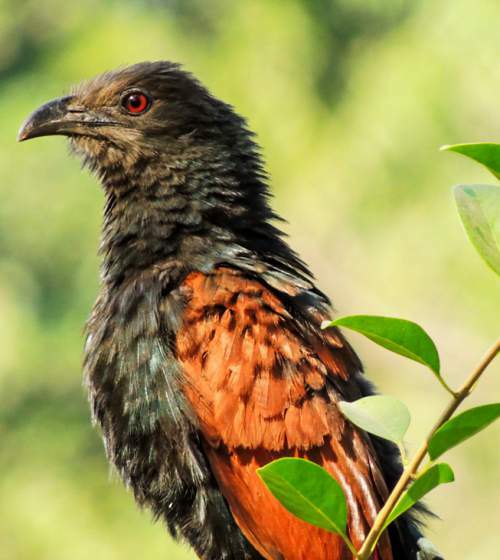 The natural ecosystems and habitats of these greater coucal species include, tropical and subtropical mangrove forests, secondary forests, dry shrublands, bamboo thickets, moist shrublands, dry grasslands and wetlands, marshes and riverine habitats. The diet of these greater coucal consists mainly of insects. Caterpillars, insects, small mammals, lizards, snakes, frogs, bird eggs, nestlings, berries, wild fruits, orchard fruits are their primary food. The breeding season of the greater coucal species is during rains, from June to September in northern India. In southern India and Sri Lanka, the breeding season is throughout the year with a peak in March and April. These birds are monogamous. The nesting sites are located in dense vegetation, shrubs, bamboo thickets and trees with dense foliage. The nest may be located as high as six meters above the ground. As part of the courtship display the male coucal offers food to female. The nest is built mostly by the male greater coucal. The nest is a deep cup-like structure built with sticks, twigs and other plant material. The typical clutch contains 3-5 chalky, yellowish white eggs. The chicks hatch out after 20 days and take further 20 days to fledge. These greater coucal species are non-migratory birds. The birds in higher altitudes may move to lower levels during winter. The global population size of the greater coucal (Centropus sinensis) has not been quantified. The overall population trend of the species is considered to be stable. Throughout its range, this species is reported to be generally common. The generation length is 3.8 years. Its distribution size is about 19,600,000 sq.km. Habitat alteration and destruction, hunting for food and traditional medicine and capture for pet-trade are the main threats that are endangering the survival of this species. The greater coucal (Centropus sinensis) does not approach the thresholds for being Vulnerable either under the range size criterion, or under the population trend criterion or under the population size criterion. The CITES (Convention on International Trade in Endangered Species of Wild Fauna and Flora) status is ‘Not Evaluated’ for greater coucal (Centropus sinensis). The greater coucal (Centropus sinensis) is closely related to the Sunda coucal (Centropus nigrorufus). The six recognized subspecies of Centropus sinensis are: C. s. sinensis (Stephens, 1815), C. s. parroti Stresemann, 1913, C. s. intermedius (A. O. Hume, 1873), C. s. anonymus Stresemann, 1913, C. s. bubutus Horsfield, 1821 and C. s. kangeangensis Vorderman, 1893. Current topic in Birds of India: Greater coucal - Centropus sinensis.